NO SCHOOL on March 5th due to the SNOW! Classes are canceled today, Tuesday, March 5th, at SCCS and Ark of Angels Preschool. Enjoy the day! It's here! Project Lead The Way is underway! St. Croix Catholic is the first Catholic school in the state of Minnesota to assume Project Lead The Way (PLTW), the nation's leading STEM curriculum. Light Their Way is a Huge Success! Light Their Way dinner event raises over $50,000 for tuition assistance. St. Croix Catholic School strives to deliver superior academics. We invite you to view this video, and then contact Diane Polley for a private tour of the school at 651.439.5581. Graduates and donors share their reflections of St. Croix Catholic School. View the video. Students, parents, grandparents, staff, and supporters gathered to celebrate our Catholic faith Thursday, Jan 31 at the second annual All-School Faith Rally. Your family is invited to visit SCCS and Ark of Angels Montessori Preschool. Meet the teachers, meet the Principal, meet other parents, explore the classrooms, and try some fun activities. Meet at 6:30 pm in St. Michael's Social Hall, 611 S. Third Street in Stillwater. 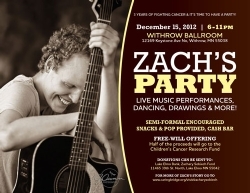 SCCS 2009 alum, Zach Sobiech, has been fighting cancer for 3 years and it's time to have a party! The evening will include an overview from Principal, Sister Mary Juliana and Assistant Principal, Mr. Sean Slaikeu. They will highlight the school’s faith-based mission, focus on leadership development, commitment to personalized instruction, and high academic standards. Meet in the Middle School Commons. Thank you to the employees of Cub Foods Corporate offices in Stillwater. Cub Foods invited the SCCS Kindergartners and their 8th grade Mass buddies to enjoy trick or treating and some SPOOOOOOOKY decorations on Halloween.